May the rivers of life now start to flow. 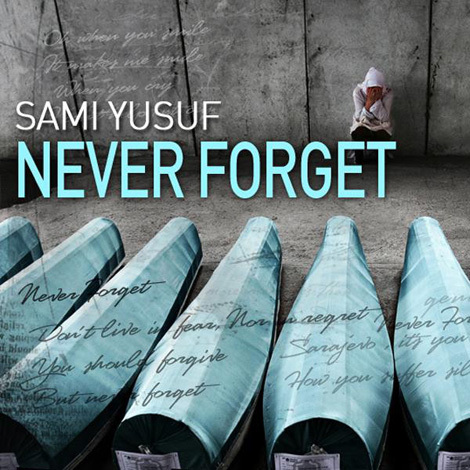 “Never Forget” is dedicated to the victims of the Srebrenica genocide and their families. This track is a live recording with the Sarajevo Philharmonic Orchestra filmed at the Sarajevo National Stadium. Bosnia has witnessed many atrocities throughout her history. Yet she keeps forgiving and forgetting…” These compelling words of a Bosnian friend struck a chord within: You should forgive, but NEVER FORGET. I can never forget the genocide that took place in Bosnia some 16 years ago. I have tried, through my own humble efforts, to be vocal about it throughout the years. However, it saddens me beyond words to admit that not many know about Europe’s worst war crime since World War II. It is my hope and wish that this small initiative helps in educating people about the reality and the truth, the truth of the genocide committed in Srebrenica (Bosnia – Herzegovina) 1995. This atrocious ethnic cleansing should be taught as a part of every school curriculum, just as we are taught about the Holocaust against the Jews. I believe that through our collective efforts we can make it happen so that, God-willing, we never relive such days. Bosnia is truly beautiful. Sarajevo, even more. Her people, forgiving. Forgiving shall only be a virtue if they never forget, when we never forget. Hvala and God bless you all.